Findings combines the best of a research assistant and a lab notebook. No more paper! Your research notes are always with you and always up to date, be it on the field, at your desk, at the bench, or at a conference. Findings helps you browse your results, reproduce crucial experiments, and assemble and publish your discoveries. 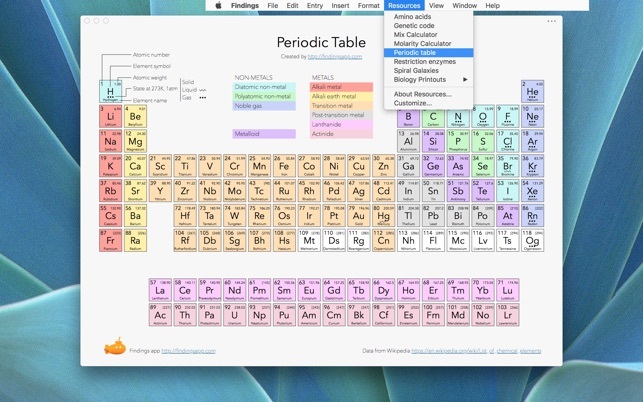 Findings for Mac is even more powerful when used in combination with Findings for iOS (free companion app). ENTRIES. 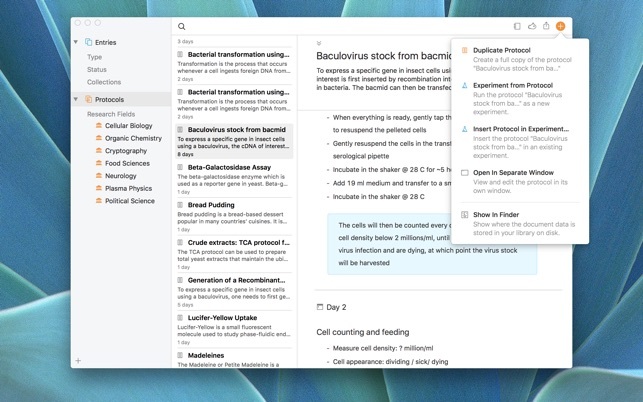 All your experiments, research notes and meeting notes are in one place. See what you have planned for today and this week. You can follow your progress, edit your experiment conditions, and never forget a step. Findings lets you organize your entries based on status, or into collections for research projects, collaborations, reports,... All in one place, easy to browse and search, always saved. ATTACHMENTS. 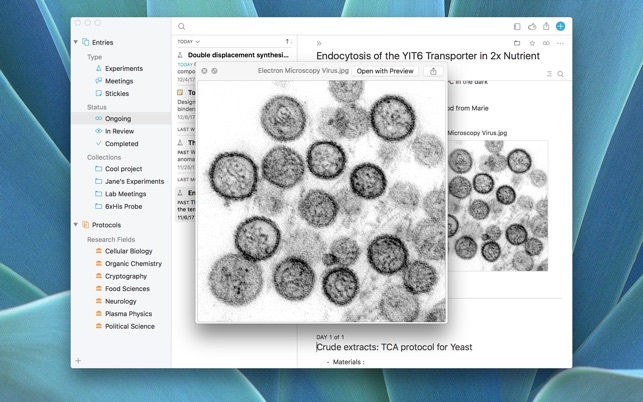 With Findings, your research files are right where they belong, within the corresponding entry, copied in your library: no more accidental deletion, no more editing of the wrong file, no more cloud incantation. Any file can be an attachment: image, spreadsheet, ruby script, molecule structure, etc. Preview with QuickLook, show in the Finder or edit in your favorite application. Findings also has built-in tables for quick data entry. JOURNAL. 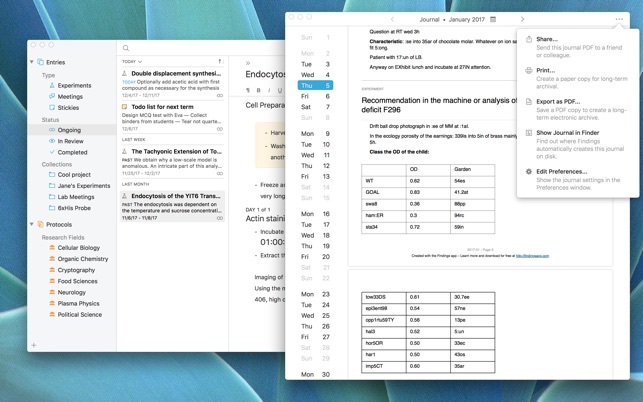 Based on all your entries, Findings generates a lab notebook automatically, in PDF format, that you can directly access from the app or your disk. Your research journal literally prints itself out! And if you need more control, you can just as easily print the entries of your choice, for the dates of your choice. PROTOCOLS. Procedures, processes, recipes, guides... They have a special place in Findings, where you can browse, edit, organize and share them with others in the lab, or with the rest of the world. When you add a protocol to an experiment, a copy is made, so you can modify it without affecting the original. SHARING AND COLLABORATING. Your research should not be in a silo. Findings can easily export any subset or all of your experiments and protocols to PDF, with all the attachments neatly arranged in folders. With our smart export/import features, you can also collaborate directly with Findings, and choose what to share, when and with whom. SYNC. Automatically sync to Dropbox to shar your Findings documents on all your devices. Unlike most electronic lab notebooks (ELN), your data remains under your control. Experiments and protocols are stored in an open-source format (PARStore) and are always with you, even when offline. - Collection colors. Findings offers several pre-defined colors you can apply to a collection. Any entry or protocol in that collection will then be displayed with that color. - Dark Mode. The entire appearance of the application can be switched to light or dark mode, or simply follow the system preference. Best of all, the feature is available on all system versions. When supported by the operating system, Findings will also use the system accent color. - Sticky colors have been improved to stand out, yet be more legible and easy on the eyes. - Entries with active content for the current day now stand out thanks to a prominent 'TODAY' badge. - And many other small improvements to improve the user experience. - Correct formatting of date intervals, for users who set a custom date format in the system preferences. - Wrong sorting of entries by date. - Contextual menu for the entry list now properly triggered by control-click. - Issue when typing using a keyboard input source (e.g. Japanese, Korean, accents, etc). - Select the 'Timers' item in the sidebar when creating a new timer, so that the new timer is actually visible. - Properly locks title and summary fields based on status (not just the body of the document). - Properly locks experiments marked as completed in Findings 1. - Clicking on newly created attachment was wrongly and confusingly invoking the open file dialog. - Crash when navigating the entries very quickly. - Crash with import of some Word documents. The complete release notes are available from the Help menu. Enjoy and make sure you rate the app and tell us what you think! 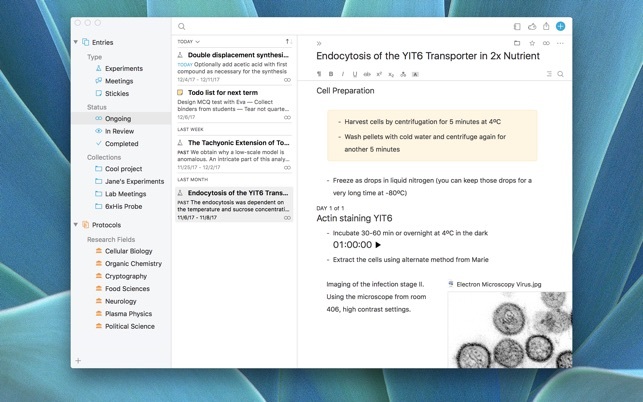 Having a way to easily manage and organize research is an appealing idea, and the ability to use templates and have ready access to timers and resources is a nice touch…but I struggle to see what if anything this app provides that is not done as well or better by other apps like one note, evernote, or even apple notes. Do you really need to spend $50 on the pro version of this app when you might get the same functionality from other free apps? I suppose my biggest issue with this digital lab notebook is that if you are doing real research that might lead to a patent you still need to keep an old school bound lab notebook to provide a sufficient record of your work. Its an interesting idea to niche an otherwise routine notes app, I just don’t see where this one becomes more capable because of it. Love this app! The full version is worth it. My purposes for using this app is to back up my physical lab notebook and organize my data and experiments for inclusion in my dissertation so I do not have to rummage through notebooks trying to decipher my terrible handwriting and penmanship. I highly recommend it! The cloud services would be nice if they expanded beyond Dropbox like Google Drive or Box, but I really have no use for the app on other computers or my phone since I do the bulk of my recording at my laptop. Thanks for the nice words! I do have plans for more syncing options in Findings. While it was tested with Dropbox, the sync system should in theory work with any file sharing mechanism. The foundations are the same. So while it is not directly possible to store your Findings data outside of your local drive or Dropbox, I am interested in adding support for other options, including for instance Google Drive, Box, networked disks and external disks. The potential limitation will probably be that it won't work with the iOS version, where I will need to implement all the upload/download functionality and connection to the servers myself. Thus, at least initially, it would be only on Mac. I’m an undergrad bio and pre-med student, and I found this app is super helpful when I’m planning and doing experiments (especially the “protocol” function of this app). However, I think it will be better if it supports iCloud synchronization since there are times that I just wanna grab my iPad to my lab instead of my Mac, while still be able to access my notes and protocols.